I have found that coaching managers is a different approach than with Scrum teams. While you are (most of the time) involved directly with the Scrum Team as a Scrum Master, managers are less accessible. They have other meetings, which you are not invited to. They might not visualize their work like you would do with a Scrum Team, making it more difficult to follow what they are doing. Your work relationship is weaker than with the Scrum team. Sometimes, they even hired you directly to help their Scrum teams only to realize that the impediments all point in their direction. It’s not always easy to show areas of improvement to the person who is paying your salary. So how do you coach them? If you can’t follow them all day, or your contract didn’t state that you were going to help them too, how do you make sure they improve their stance as a manager along the way? One way that I found is through monkeys. While I was attending one of Lyssa Adkins class about coaching Agile teams, Lyssa explained the difference between a consultant and a coach. For her, our customer has a problem represented with a coffee cup that he holds in his hand. A consultant will take the cup away as a sign that he solves the problem of the customer. This is good in some situations. Let’s say the customer doesn’t have the expertise to build a web site. The problem, building a web site, is removed from the hands of the customer. A consultant (or company) will take the problem away from him and solve it because it has the expertise. On the other hand, a coach will ask the customer to keep the coffee cup in his hand. It’s a problem the customer must solve by himself, not by handing it off to someone else (or to simply put the cup on a table and walk away). In other words, the coach will question the customer about how he can solve his problem. Compared to the consultant, the coach never takes the problem. He leaves it in the hands of the customer. Let’s say a manager must have a difficult conversation with an employee regarding his performance, the coach will make him think about different approaches the manager can take to solve his problem. The coach won’t have the difficult conversation with the employee. It is the manager’s responsibility to do so. While the customer is holding the cup, he discovers his own action plan to solve the problem at hand. Most of his action plan will be assigned to himself. As managers are good at delegating, they might be tempted to delegate this problem to someone else (Ex: the coach). As a coach, you have to remind the manager about how he must resolve by himself the problem at hand. The manager has to assign to himself a todo, a call-to-action. To illustrate this comically, I often use the analogy of monkeys. “You have to take this little monkey on your shoulder Mr. Manager”. If the manager didn’t take care of his monkey, I can initiate a conversation with “Did you lost your monkey?” to remind him of the task at hand. To have a stronger impact with the monkey metaphor, I actually have little monkeys. Bought for a couple of dollars at a Dollar store, they patiently wait in my drawer. If a manager has agreed on an action plan where he has some tasks to do, I give him a monkey. It reminds him about the difficult task at hand. It brings humour to the situation while making a point. 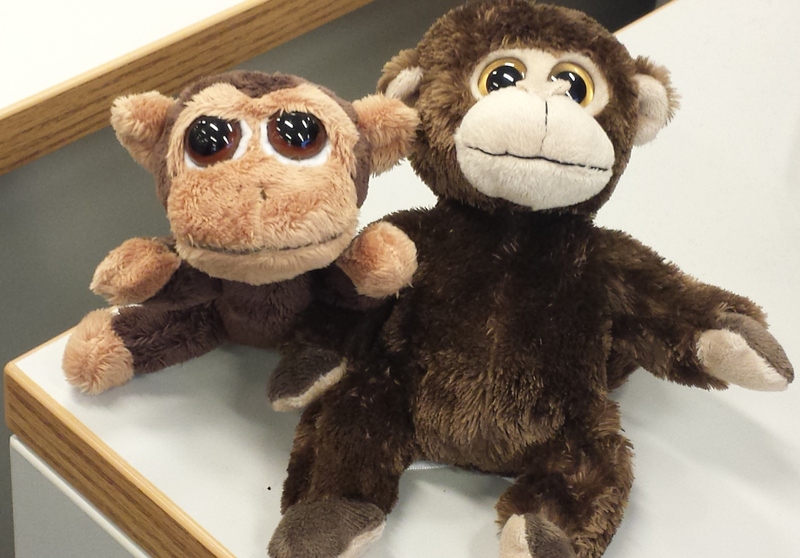 At my workplace, you can actually see the office peppered with monkey dolls on desks. People teased each other "Oh, Louis gave you a monkey." or "What's your monkey about?". To close the loop, I ask the person to bring back the monkey once his task is done. It's a great way to gather feedback at the same time. As it forces him to bring back the doll, I can easily do a follow up. I've come to realize that this trick is effective in situations where people do not want to take their responsabilities. If I work with people who have a strong sense of ownership, I won’t bring in the monkey trick. I’ll focus on something else. In one team, the team had a strong sense of ownership but they didn’t collaborate on tasks. I used another trick, the washing line trick. But that’s another post all to itself. Until then, I encourage you to try out the monkey trick if you find yourself in the situation I explained above. Let me know if it had a positive impact in your work environment.